Patient satisfaction continues to play an important role in medicine for healthcare organizations, consulting firms and government agencies alike. Not only is the industry acknowledging higher expectations of healthcare consumers, but also understanding that better patient satisfaction drives better patient outcomes and lowers costs in the long run. While there are lots of programs that reward high-performing clinics in patient experience (HCAPH Surveys, QPP), it’s also crucial to be efficient in actually collecting feedback to improve and monitor PX. Our product Luma Health is a patient engagement tool with feedback as one of its powerful features. It gathers real-time feedback via text message to track patient satisfaction. By looking at internal product data, we found that there’s a lot to learn about the relationship between healthcare NPS and the Yelp platform. 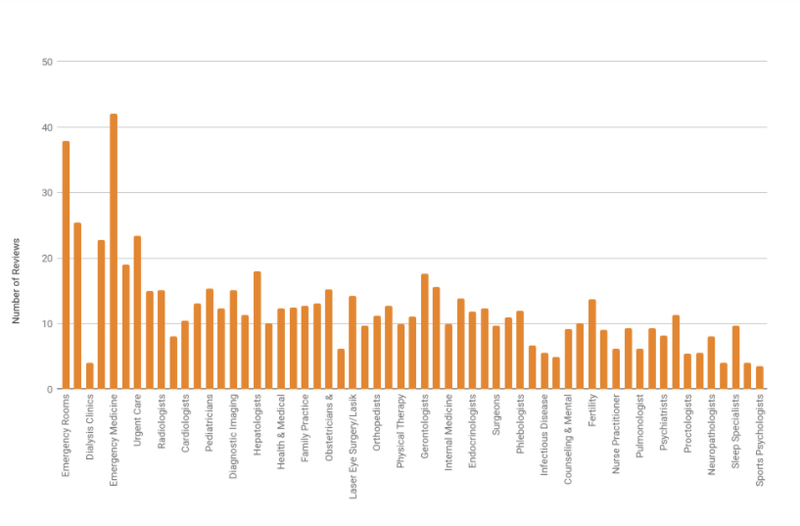 First, we found the NPS of clinics using Luma tends to score higher than most other industries according to NPS Benchmarks. 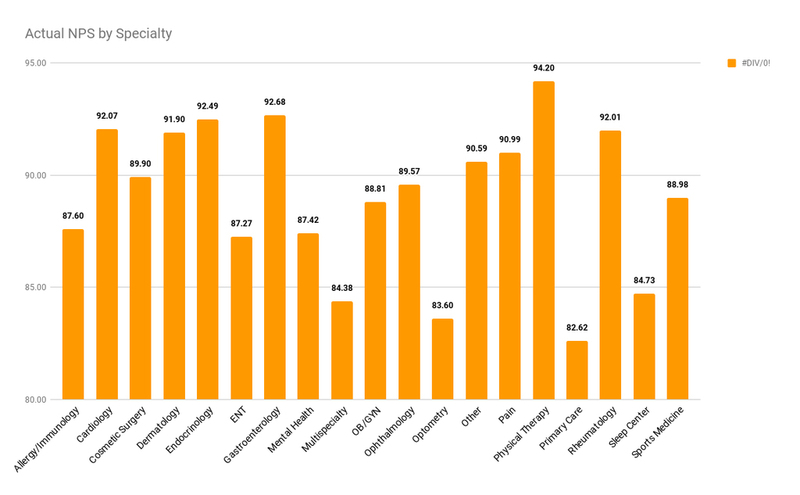 Even the lowest performing specialty Primary Care still has an exceptional average NPS of 82.6. 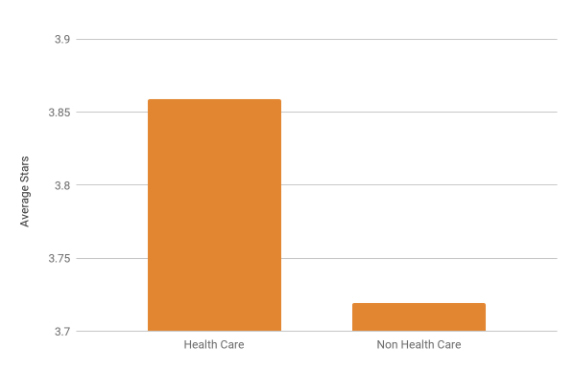 For context--according to aggregate net promoter scores, healthcare as a whole has a very strong score of 74 and actually performs the best when compared to several other industries, even trumping education and hospitality (and anything above 70 is considered by some as “World Class”). To test this hypothesis, we also used the Yelp dataset. 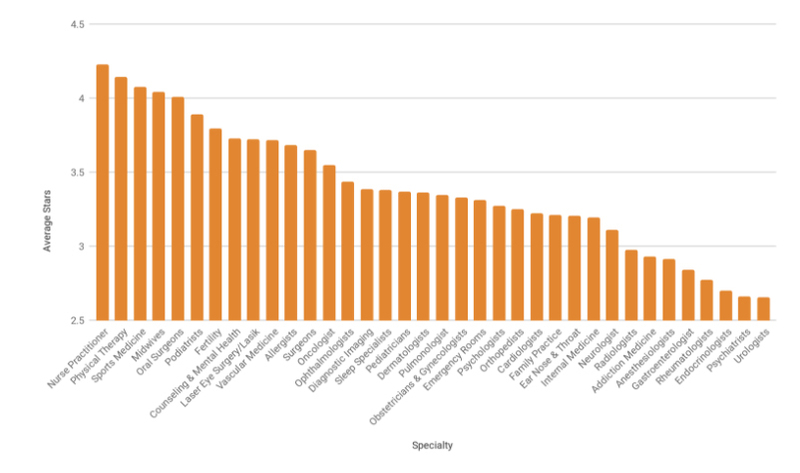 Interestingly, the NPS data for Luma practices seems to parallel the Yelp data for specialties with highest patient satisfaction. We evaluated 12,532 healthcare businesses, which yielded 161,068 reviews. We were also able to see how various different specialties perform on the Yelp database. This suggests two interesting theories. One is that healthcare businesses are generally providing a positive patient experience. And two, that they can (and should be) making the most out of this positive feedback by asking patients to engage more with review sites. According to the American Customer Satisfaction Index‘s 2017 Utilities, Shipping, and Healthcare Report, hospitals achieved a customer satisfaction score of 75 out of 100, placing the healthcare industry 32nd in customer satisfaction (beating internet providers, but trailing behind banks). In reference to the Yelp dataset, healthcare businesses versus all other businesses perform at 3.86 stars and 3.72 stars respectively. According to the Yelp dataset, the majority of practices tend to have below 20 reviews, compared to the average 56 reviews in the restaurant industry. Despite the generally positive feedback of healthcare businesses on Yelp, there’s still a clear opportunity for clinics to get patients to engage with similar public review platforms. See a comprehensive data analysis, broken down by specialty here. To see how your practice ranks compared to others on Yelp, Luma even created a free tool. The benefits of getting patient feedback are discussed at length within the healthcare community (i.e. having a neutral MACRA adjustment, boosting online visibility, etc...). But implementing best practices to actually collect responses is still maintains a huge area for improvement. After all, some HCAPH Surveys are still physically mailed in, which only creates a barrier to response rates. Luma is powered by a mobile-first platform. We’ve found that texting allows for up to 50% more responses in comparison to email surveys, which have a response rate of 10%. Texting has also proven to be the most effective across all demographics, socioeconomic statuses and age groups. Contrary to popular belief, texting is extremely effective with patients of an older demographic. 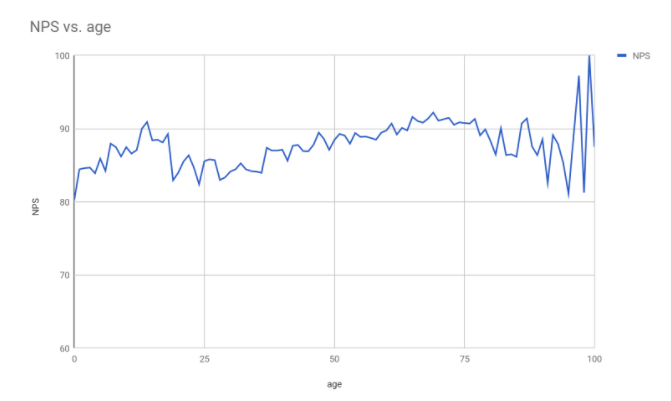 In fact, Luma’s patient responses appear consistent across patient ages. There are two peaks in our data where patients are most satisfied with healthcare--one centered in the late teens, and another in the late 60s. There is a mild dip between these peaks; this suggests that these are healthcare consumers on an elective basis, thus having more options and perhaps more selective about their care. All in all, data points like this continue to add-on to understanding PX as a whole. Though healthcare appears to perform well based on the available data sources, it doesn’t mean patient satisfaction isn’t a problem. In fact, we shouldn’t merely aim to exceed standards set by other industries, but rather hold ourselves to an ever rising standards in our own. It’s a relevant time to take advantage of platforms like Yelp and other sites where patients openly share experiences with each other. Doing so will propose improvements your clinic can actually act on, create a sense of transparency, and progress patient satisfaction and experience in the long run. Tashfeen is a radiologist, self-taught coder, healthcare innovator and Co-Founder of Luma Health. Contact him on Twitter at @tashfeenekramMD.